Knit By God's Hand: 21 is a lucky number, right? 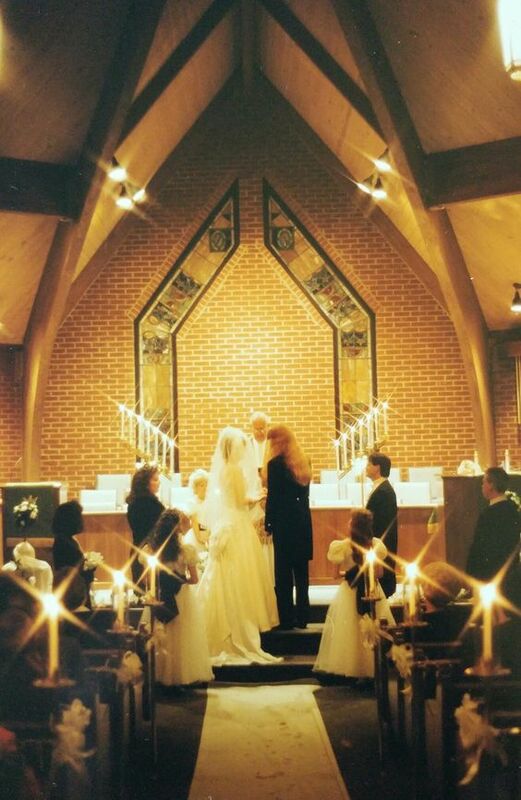 21 years today, I became Mrs.Vincent. I've actually been with Ricky more than half of my life at this point. We dated for 3 years before we got married, so I was just days away from turning 21 when we started dating. I actually think my 21st birthday was our 'official' first day... ahhhh... - & I am going to be 45 this year. So yeah... more than half of my life, this red head man has been by my side. Crazy. It's so funny how I can't remember what I did on Monday, but I can remember October 28, 1995 so clearly. ....It was a cloudy, gloomy, sprinkling day. Brides - don't freak out when it rains on your wedding day. They always say rain is good luck. I'll stand up as proof of that. 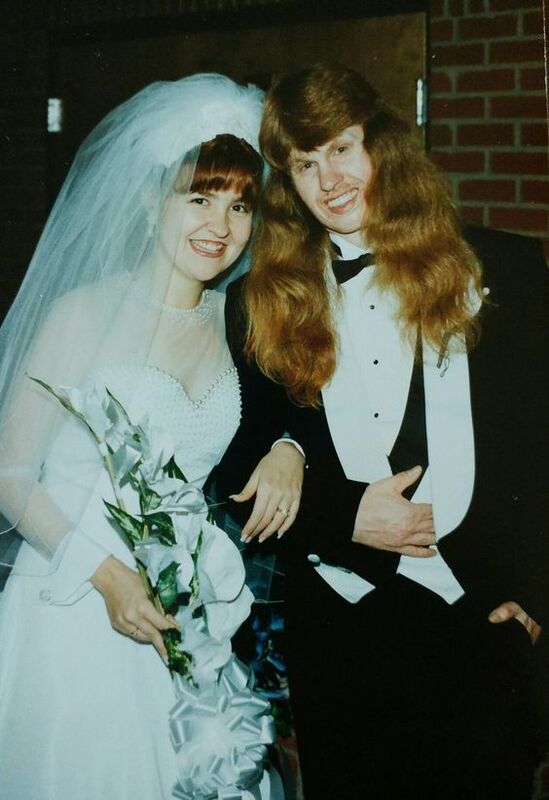 ....My bridesmaid & my brother's girlfriend at the time is a hair dresser... she went to do my hair in a french twist & for some reason, she totally couldn't get it to work. I sat at my kitchen table with her trying to get it right for HOURS. It actually became funny. & obviously, it all worked out in the end. ....I rode to the church with her in her car & played over & over again Twila Paris, "God is in Control"... that's a throwback song for you Christian music fans. ....They had all the girls crammed in one room & it was so hot, I thought I was going to pass out. We finally got the clear to go in the reception area so I could breath. I see this picture & see my teeth haven't shifted to a crooked mess like they are now. ...Ricky hates getting his picture taken so wedding pictures were a true torture for him. The whole day kind of was with attention being focused on him. He was a trooper though. ... I never saw Ricky before the wedding, but he told me later someone opened the door to the room he was in & he saw me. He was just anxious to see my dress because I had him scared to death it was something crazy in style. I had him convinced it was short & something totally out of the 80's. ... I still to this day think my dress is the most amazing dress in the world. I think every bride should feel that way about their dress. ... Our photographers were a married couple - who were arguing the whole time. & the wife was flirting with my brother the entire night. How messed up is that? Plus, I look back at wedding pictures now & cringe at them - especially doing wedding photography myself. I mean, there are probably 5 pictures of Ricky & I after the wedding together & there are probably 2 poses. Only 2 pictures of us dancing. No pictures of me getting ready, or anything with my bridesmaids except one picture of us all up front together. I want to do my wedding pictures over again please. The photographers didn't even get any pictures of Ricky & his family. I just happened to find this picture in an album of prints people had taken on their own. I guess I need to remember this was the day before digital photography. Everything was film. A different world. ... I so loved having a candle light ceremony. It made it easier for Ricky to have it darker in there & it was just the coziest feeling. I am such a sucker for candle light anyways. I can remember standing up there looking at Ricky & just the warm lights from candles made it all so beautiful. ... I laughed the entire wedding ceremony. Like laughed hysterically. Does this surprise anyone? People thought my back shaking at the front was me sobbing crying, but those that knew me well - they knew I was laughing. What can I say? I was a happy bride. ... 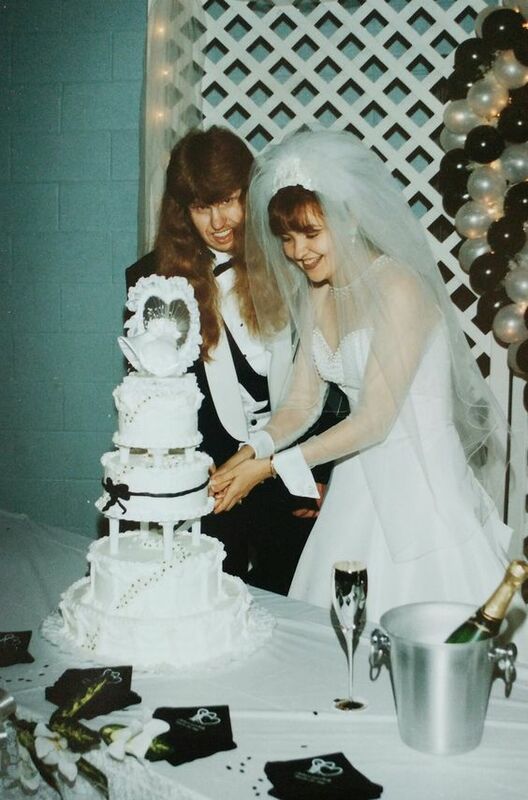 I loved my wedding cake because it had black flowers on it. I was all about the black & white theme. Funny thing, this wasn't even the cake Ricky & I had picked out. My mom had gone back to the cake person & had them add in the tiers to give it height. I actually loved it more. Carrot cake was our cake of choice - Ricky's favorite. ... Our first dance was to Dan Hill's "Never Thought" ... though we did have Steven Curtis Chapman sung during our wedding & had KISS played during our cake cutting. ... I didnt get one bite of food the entire night. I can remember after the wedding, we took everything back to my parents house & I was ravenous with the food. That's a long day with not eating. Chalk that up to being young. It wouldn't happen 21 years later. It's so funny to look back at pictures of the day & see how young we were. It feels like yesterday but also like a lifetime ago. 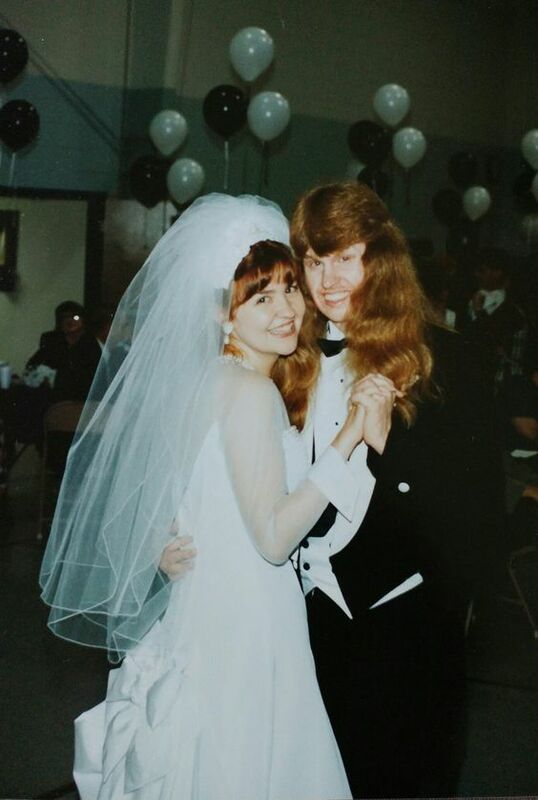 Crazy to think we've been married for over 2 decades now. OMGosh! I think this is my favorite post! Really!! Wayne and I celebrated 21 years in April and I still feel God's favor and blessings on my man and my marriage! Your wedding dress was beautiful, Rebecca Jo, and I totally agree with you that every bride should feel like their wedding dress is their favorite. I ended up choosing the very first dress I tried on! Happiest of anniversaries to you both! Oh my gosh- LOOK AT YOU! You are seriously the most adorable bride! I think you look like a teenager in those photos! Happy Anniversary to the two of you!! Aww... this is a great post! I love how clearly you remember things from the day, and you guys look amazing :) What a funny story about the wedding photographers, especially given that you're a wedding photographer now. They definitely sound unprofessional. BABY REBECCA!! look at you guys!! i love looking at pictures of the past as well...totally mind blowing at how much time has gone. LOVE THIS! Happy Anniversary, you two! Hope you have the best day and cheers to many, many more! Happy Anniversary!! I love all of the little details you remember about the day and I love that Ricky was worried about your dress/you tricked him-- your dress was so stunning! Happy Anniversary - you two look fantastic, and I love that you are still in love that dress! The candlelit ceremony is so beautiful, too! Aww what a beautiful post and beautiful wedding day! I can't wait until the day I get to say I've spent half my life with someone. Ps, my wedding photographer wasn't very good either. I mean at the time I didn't notice it but after we got the pics back I was a bit disappointed. She only ever put us in 2 different poses and there wasn't even one pic of my parents together (so sad). What a beautiful post! Happy Anniversary!! You were a beautiful bride!! Love love love your wedding dress. Aww look at you two! You look the same 21 years later!!! I love your dress it was gorgeous!!! And your cake was so pretty. Carrot cake is a good choice! Such a beautiful post. Happy Anniversary! Happy Anniversary! I LOVE your dress! 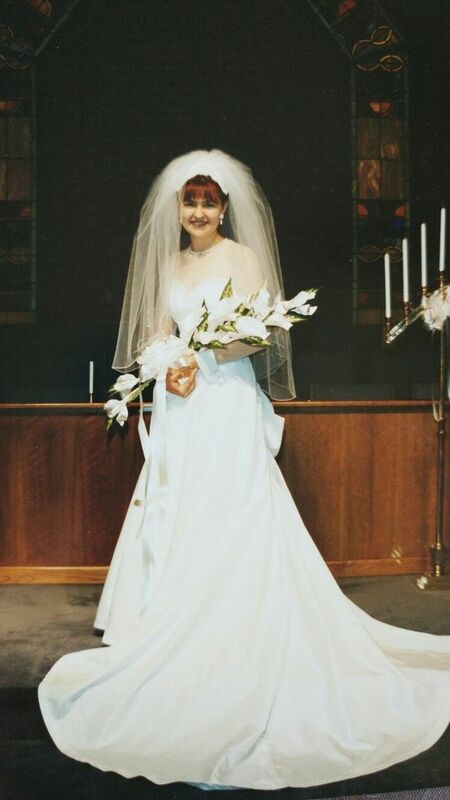 So many times, you look back at dresses from different decades and cringe (like my mom's 1982 wedding dress! ), but yours is so timeless and fashionable to this day! Happy Anniversary! I love how vividly you remember all the important things - and the day as a whole. But no bueno on the no food, I would be a real monster if that happened. Note to self, bring snacks. Awww, love posts like this! Happy anniversary to you two lovebirds! And I love the pic of all the candles lit up--so romantic! I've decided that getting into photography might have been one of the best/worst things I've ever done to myself since it makes me look back at SOOO many past photos and just cringe, cringe, cringe (and I DID get married in the time of digital photography! I just wasn't super selective about who I had take the photos on the big day). Hope you guys ended up doing something fun for your anniversary even if the whole thing didn't go as planned with your scheduling mishaps and everything! It's crazy how fast the years fly, I have been married almost 26 years now. awwwwwwwwwwwwwwwwwwwww <3 i love this!! happiest of anniversaries to you both! OH my gosh, Ricky's hair! Holy cow, it was gorgeous! Happy Anniversary! My wedding theme was black too :) Bridesmaids dresses in black. You were gorgeous and your dress is timeless! What fun to see these photos and share in your wedding day memories! Rebecca Jo, your dress was gorgeous and you were a lovely bride! When I was in the wedding cake business, I can't even count the number of times the MOB came back to change the cake her daughter ordered! Ha! Glad you like what she did! Happy anniversary, you two! Oh -- happy happy day to you and Ricky! 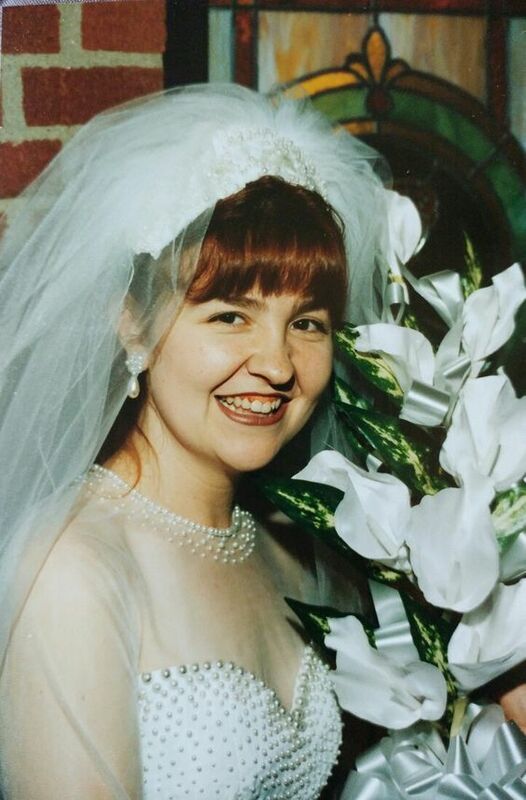 I was a 1998 bride and my wedding photos were similar. 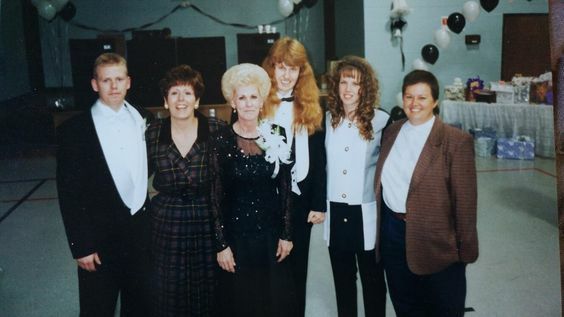 Weddings and receptions "back then" were so formal compared to what they are now -- I think I'd totally prefer to have a wedding now as opposed what was 'routine' then. My photographer totally monopolized our time and we made it downstairs for the reception ... only because the cake was melting and she wanted a photo of us cutting it ... then back upstairs to finish her list. By the time we were done and got back downstairs, pretty much everyone had left. It was just a cake and punch wedding, but still. Enjoy your day today and happy anniversary!! This is the sweetest! I love the photos. So cute! Thanks for sharing the memories of your day. Wedding days are so special. Bummer about your pictures. My dad is a photographer. He doesn't do weddings anymore but used to back in the film days. You're too cute in these pics! Happy anniversary. You look beautiful. I wonder if those photographers are still in business or if they are still married! I hate our wedding pictures. I would not mind no pictures either. I meant new pictures. Not no pictures. Happy Anniversary! What wonderful pictures and memories...I may have to snitch the idea of sharing some next month when Tim and I celebrate 32 (!!) years. So beautiful, I love this post. Happy Anniversary!!! I love seeing your wedding photos. 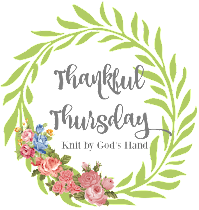 Thank you for sharing them and Happy Anniversary!!! Your dress is amazing, and your right, a bride should feel that way about her dress. I loved the beaded bodice. Happy anniversary to you & Ricky!